You don’t need a huge garden to grow fruit. Choose wisely and you can grow trees and soft fruit among your vegetables. The fruit Garden of your dreams. Few gardens today have the space for an orchard devoted exclusively to fruit trees and bushes. Even so, with a well planned garden you can have enough fruit to take you through the seasons. The best position for a fruit garden: In today’s smaller gardens, all fruit plants �- trees, bushes and climbers alike � are often planted together. Fruit gardens and orchards should, as far as possible, occupy an open space that is neither too wet nor susceptible to spring frosts. The best positions are on a south or west�facing slope, just below a sheltering wall or hedge. 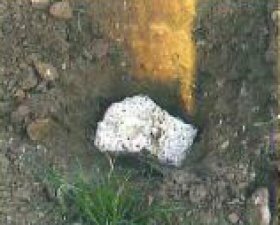 The worst positions are in a frost pocket or on waterlogged or frequently flooded ground � for example, on a slope just above a high wall, a tall hedge or a wood. Avoid the area to the south of your vegetable garden, as the tall fruit trees will cast shadows over your crops. If possible, don’t choose a site that is isolated from other gardens. If you do, you are likely to suffer from more than your fair share of fruit�plundering birds, and your trees won’t be pollinated by other fruit trees in the neighbourhood. 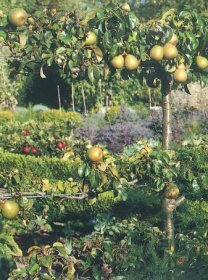 What to plant where: Plant fruit trees in a lawn or meadow, but remember to leave enough space to mow the grass between the trees. 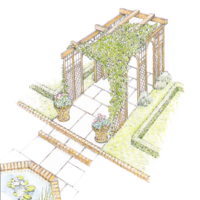 Don’t forget height either � some standards, especially cherries, can grow to 15 metres, whereas dwarf fruit trees may be so low that you have to duck when mowing, making it a better option to plant them in a border on their own. 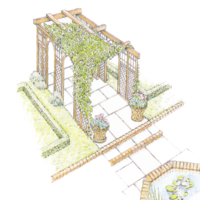 Plant espalier vines and trained soft fruit bushes against a sheltered, sunny wall. Plant cordon and fan gooseberries, blackcurrants and raspberries around the edge of the vegetable garden or in a fruit frame. Strawberries also go well in the vegetable garden. A tree is a long-term commitment, so try not to plant one that will take up a lot of space in a small garden. You, or your successor, will be forced to cut it down prematurely as it outgrows its space. This is particularly true of walnut and cherry trees, both of which can eventually grow to at least 15 metres tall and spread to between ten and eighteen metres wide. Ask the neighbours: There’s nothing better than taking a good look around the neighbourhood when you are planning a small orchard or fruit garden. To find out which species and cultivars thrive in your area, ask neighbouring gardeners for their recommendations as well as their advice on what should be avoided. Local farmers’ markets also re?ect what grows well in a region and may help you to choose trees and fruit bushes that will be happy and that are sure to produce fruit in abundance. But that doesn’t stop you experimenting, trying some old varieties and using a bit of imagination. Terms for trees: Fruit trees have different forms, depending on their vigour and habit, and the size and structure required. Standard: A tree growing freely on a trunk that is 1.8 metres to 2 metres tall. Half standard: The same as a standard, with a trunk 1.2 metres to 1.6 metres tall. Small standard or bush: A standard with a very short trunk. The vigour of the tree depends on the rootstock, which produces either a dwarf bush or one that develops much more freely. Cordon: A single-stemmed tree with no framework branches, the fruit-bearing branches being arranged along the central leader. There are vertical cordons, those that are planted at a 45� angle and horizontal cordons, which are known as ‘step�overs’ as they can literally be stepped over. Fan: A tree that has been trained to grow flat in a fan shape, either against a wall with wires or on a free-standing network of wires. A fan tree is a good, space�saving way to grow both cherries and plums. Espalier: A tree trained flat against a wall on a framework of wires, with pairs of branches stretched out horizontally every 40cm or so like a ladder. This is a very formal way of training. The ultimate size of a tree: Before planting a group of fruit trees make a note of their eventual spread. When mature they will suffer if they are planted too close together. Fruit trees do, however, appreciate a pollinating partner nearby so that bees can dance from one tree to the next. You will get far more fruit if trees are in groups. Buy your trees in autumn: The current fashion is for container�grown trees that can be bought all year round. However, at certain times of year nurseries offer a wide choice of bare�rooted trees, which is a more traditional way to buy fruit trees. Although they are available throughout the period when the trees are dormant, they are best bought and planted in late autumn. They will then have the entire winter to put down the new roots they’ll need to get away in spring. If possible, visit the nursery and choose the trees yourself. Select only those with shiny bark, a good root system and well-balanced branches in good condition. Long-lasting stakes: Stakes are vital if you do not want your young standards and half standards to blow over in the first gust of wind. Choose a stake that is as thick as your arm and long enough to sit just below the crown of the tree once it is hammered into the ground. Char the part that will be buried to prevent rotting. A precious stone: Before you plant your tree, place a large stone in the bottom of the planting hole. It will serve as a wedge that prevents the tree sinking when the hole is filled in and the soil firmed down. It is bad for the roots to be planted too deeply � the uppermost roots should be almost level with the surface of the soil. Avoid planting trees less than, two metres from the boundary of your property. It the branches of your fruit trees overhang your neighbours' garden, they can legally gather any fallen fruit and cut back any branches or roots that encroach on their property. You will not be able to gain access to pick fruit from overhanging branches or prune without permission. Over and above the strictly legal aspects, avoid planting a vigorous tree in a position where it is likely to block your neighbours’ view or cast a shadow over their house. A Choice of trees to suit your garden. 1. A large stone in the bottom of the hole will keep the tree from sinking when the soil is firmed down. 2. A handful of cereal grain will germinate in the soil and give off hormones that promote the tree’s root growth. 3. 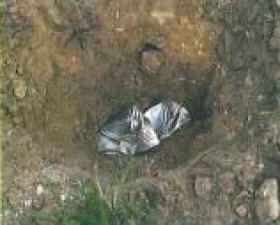 One or two crushed food tins in the hole form iron oxides and sulphates that will prevent the roots from rotting.